Stress balls come in a variety of shapes, sizes and colours. These orange stress balls are our best selling stress balls and with the numerous colours available its not hard to see why! Orange stress balls can be custom printed with your company logo like all our stress balls and make great promotional stress balls. The orange stress 70mm balls are made from PU foam and provide hours of squeezy ball fun. 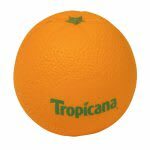 These orange balls are just one of the many stress balls that we have available. Take your stress out on one of our orange balls and help relieve your tension.